Making some dietary changes and decided to try different things with cauliflower. It's pretty bland on its own, but with the right seasonings it can be pretty tasty. Riced cauliflower - I found some frozen packages from Hanover and picked up a couple. Pop in the microwave for 4 - 4.5 minutes and they are done. Tried the cilantro-lime and Asian stir fry versions, and both were tasty. Note: haven't tried making my own "rice" yet but may try that soon. Instantpot - Steam for 0 minutes, then instant release. Season with salt/pepper and a little butter. Also with a sprinkle of parmesan. Oven - roasted with other veggies and glazed with a balsamic vinegar reduction. My wife is working on a buffalo cauliflower recipe using our air fryer. Needs some work though. The taste is there but she doesn't have the crispiness down yet. She's tried both flour and Panko crumbs. May have to go full blown batter. Sounds like you have a magic pot. Oven roast after coating in bread crumbs. Little bit of olive oil spray. No, 0 minutes is correct. It cooks the cauliflower in the time it takes for the IP to come up to pressure. Thanks. Just bought a high-tech oil sprayer for spritzing. I had one too. Kept clogging and needed too much attention. Now I just get a can of olive oil spray. I've got to get a food processor bigger than the baby one I have first, else it will take FOREVER. Thinking about getting another Kitchenaid as I loved the one I had, but checking out other brands, too. Too many choices! Those suggestions sound really good. Love me some risotto. Yes, I do and am a smart shopper. And now I have a new baker's rack in my kitchen to hold them all. Well, some of them anyway. You can try "fettucini" sauce using cauliflower. My wife made it....once. So I made a whole head of cauliflower in the Instantpot tonight and it is the bomb. I just cut out the stem, then brushed the entire head with a mix of melted butter, EVOO, garlic, and spices. I had leftover chicken broth in the bottom from the chicken thighs I just did, so I set the head on the rack and set the time for 1 minute, then did a quick release when finished. Placed the steamed head on a baking sheet, sprinkled with grated parmesan cheese, and broiled until lightly brown. Also, you can use whatever spice mix you wish. I have one that is perfect without overpowering the cauliflower I got from BJ's called "Simply Asia Orange Ginger Garlic Seasoning." I also use a grated Parmesan cheese that is jarred but has no cellulose filler (i.e. sawdust!) 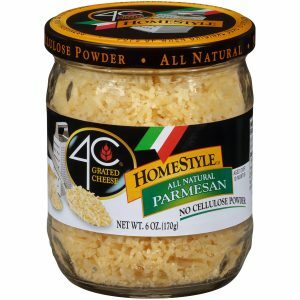 called "4C All Natural Parmesan Grated Cheese." You can get it at most grocery stores.